In Pokemon GO, the mystery behind hatching eggs can be stressful. There are plenty we’d kill to see. There are plenty more we’d rather never see again. Regardless, we can’t help but sweat a little at the mysterious probability behind the eggs. This is especially true with the most valuable eggs that take 10 kilometers to hatch. There have been charts before that guessed at the hatch rates, but nothing was really definitive. Now, though, we have a much more reliable set of figures. 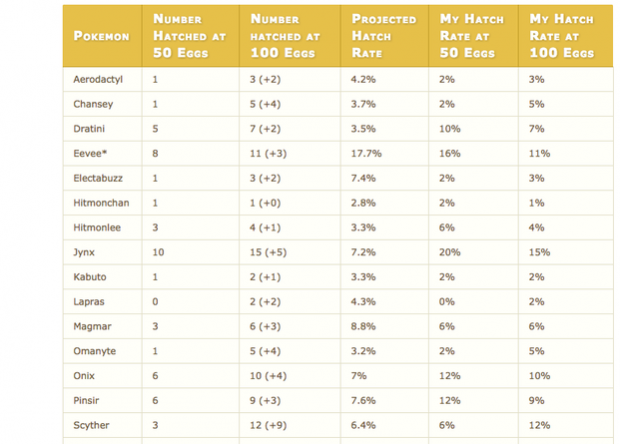 Silph Road member, EmergencyTaco, has posted a chart of findings after documenting the hatchings of 100 10K eggs. Look below to see what was found. Of course, this chart is far from perfect. If this were a perfect world, EmergencyTaco would have had thousands of eggs worth of data from all over the country. The first issue with the chart is that eggs are rumored to be different depending on location. If so, that would mean this chart really only benefits players in ET’s hometown. Regardless, it is fascinating to see these kinds of findings. At the very least, at least ET found a little of everything. If you haven't noticed, Pokemon GO has an intriguing experience system. At first.. If catching Pokemon is the bread of Pokemon GO, then PokeStops are definitely th..